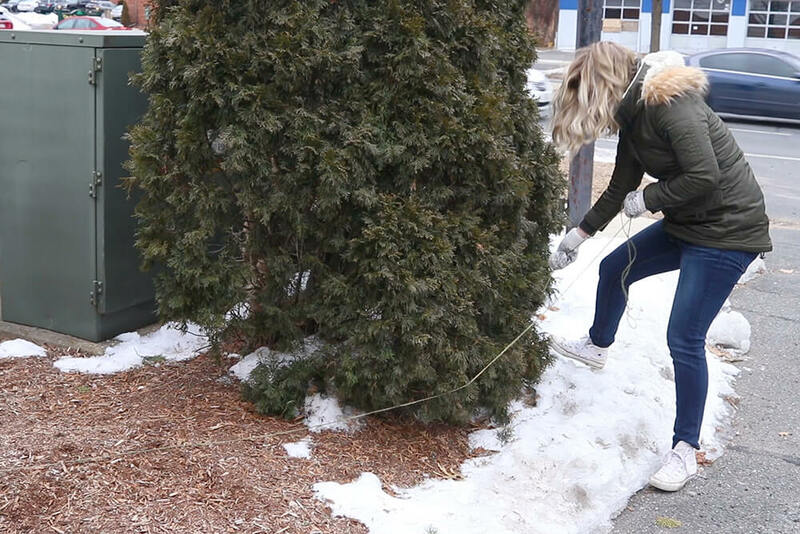 Have your trees, bushes, hedges, shrubs, or saplings been taking a beating from all the salt being dropped on the roads? 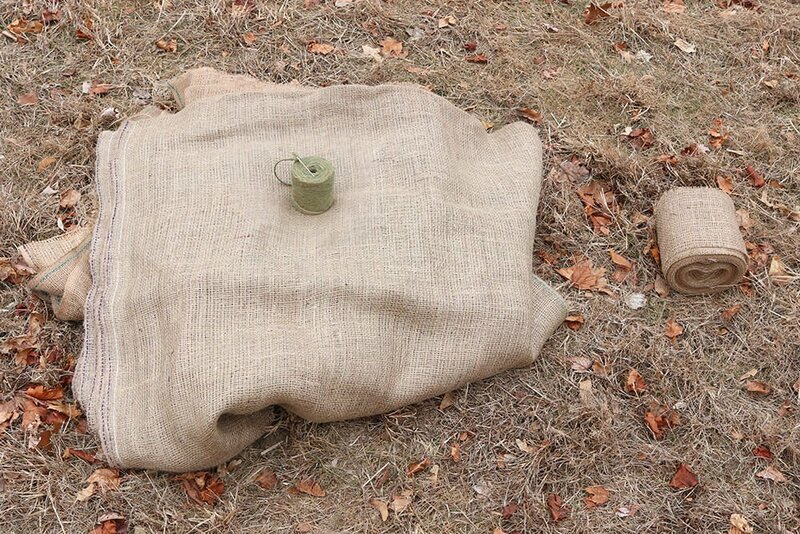 Wrap them in burlap so they are protected from the elements and salt. 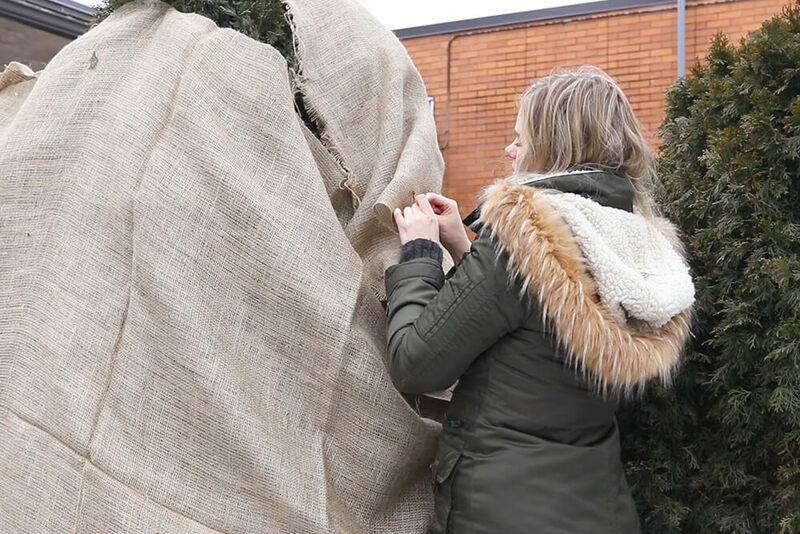 The best time to wrap trees is in the late fall just before the first frost but if you notice damage from the weather or salt you can wrap them at any time. 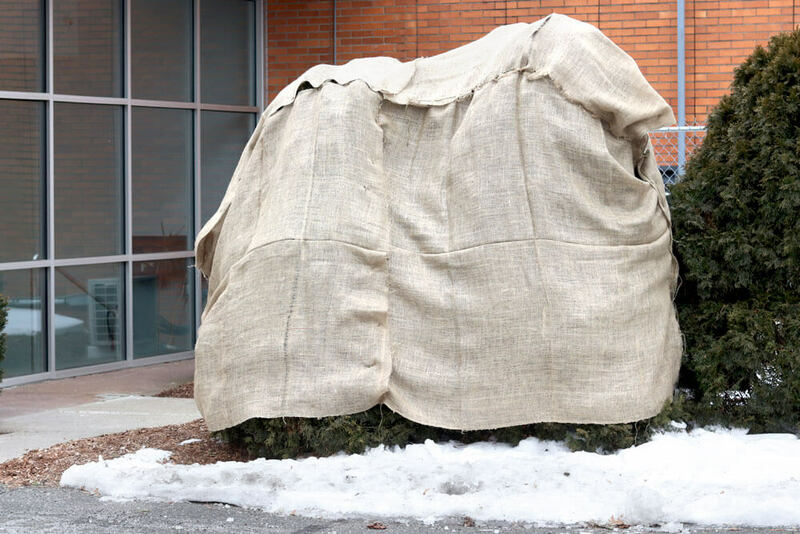 Burlap wraps like this will protect your trees from sunscald, salt, wind, and will keep them from becoming deformed or splitting under the weight of the snow. 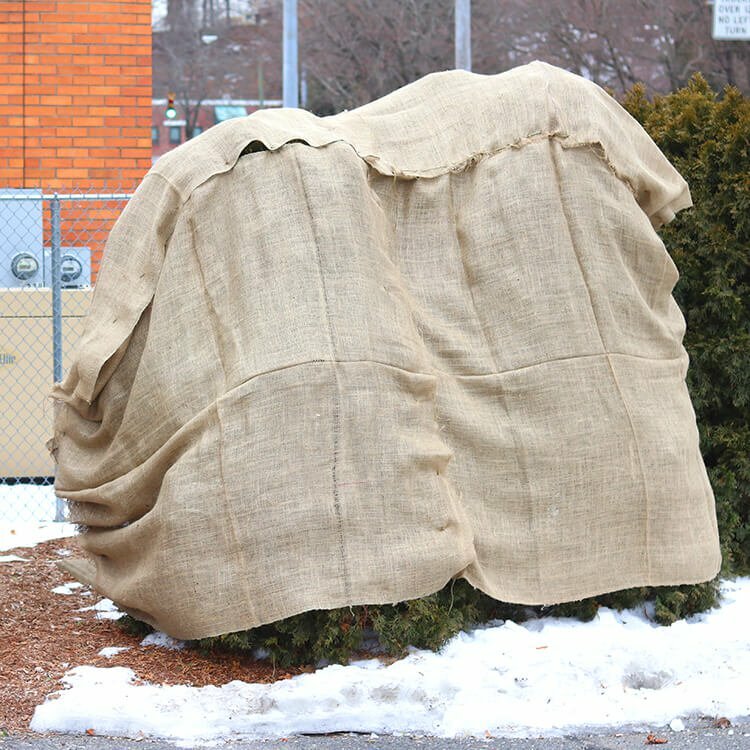 The bushes I covered are large so I used burlap squares. 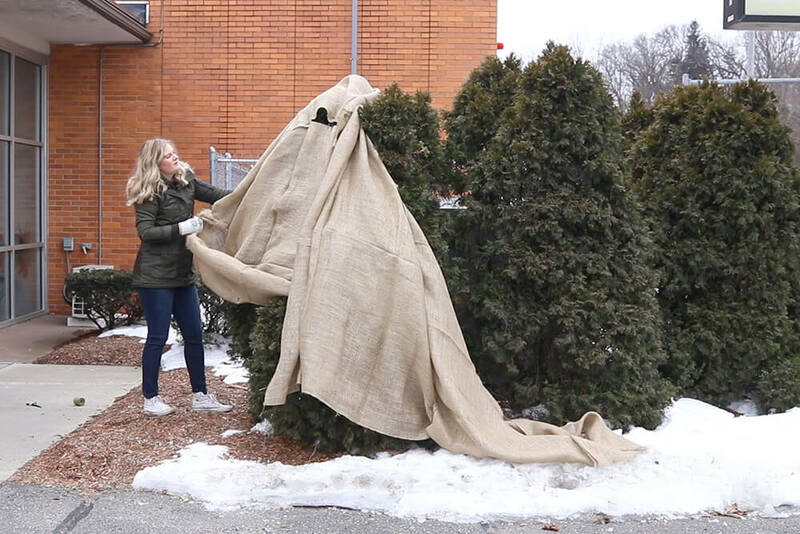 You can also use burlap by the yard or burlap bags for small trees and bushes. 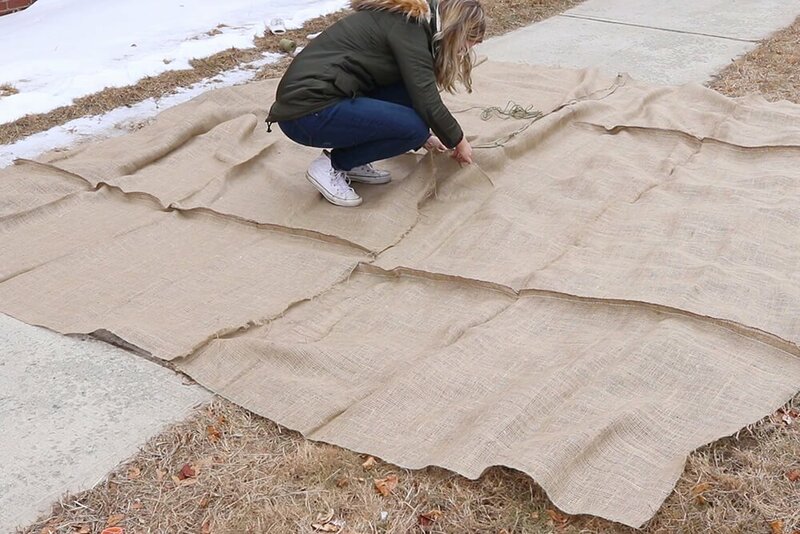 Measure your trees to determine how much burlap you will need for your project. 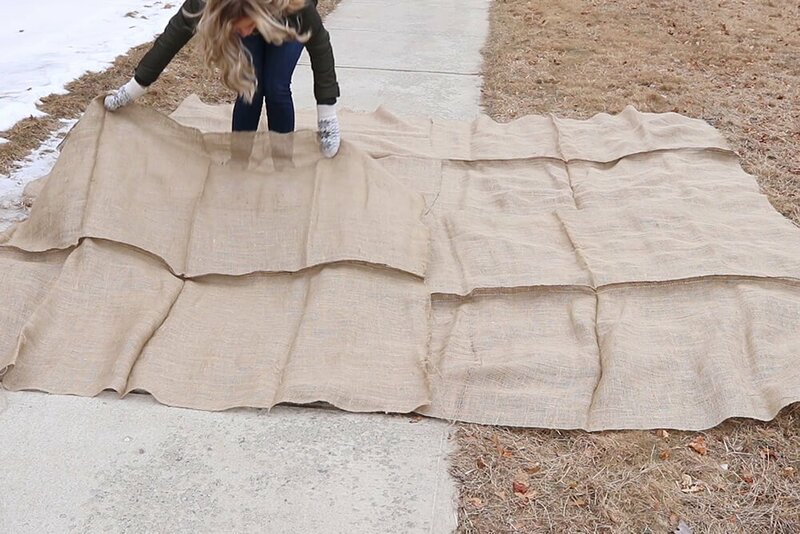 I’m using 6 x 6 foot burlap squares. 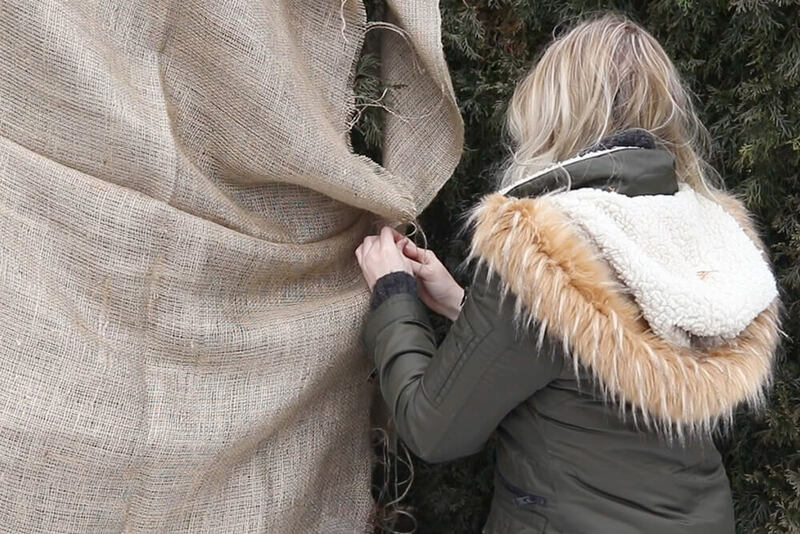 Using the twine and needle, roughly sew together the burlap pieces so they are able to easily slide over the trees. I sewed my four squares together to make one large square and then folded that in half and sewed down one of the edges. 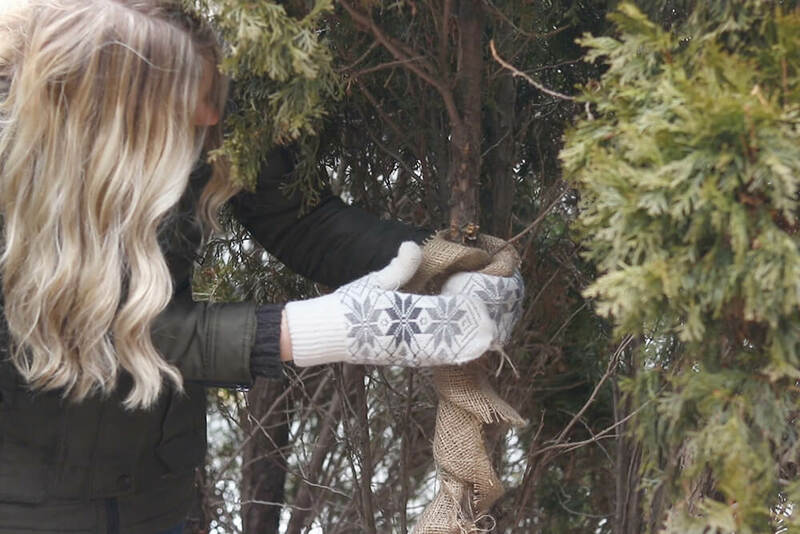 Collect the branches of the trees and loosely wrap them into shape using the twine. 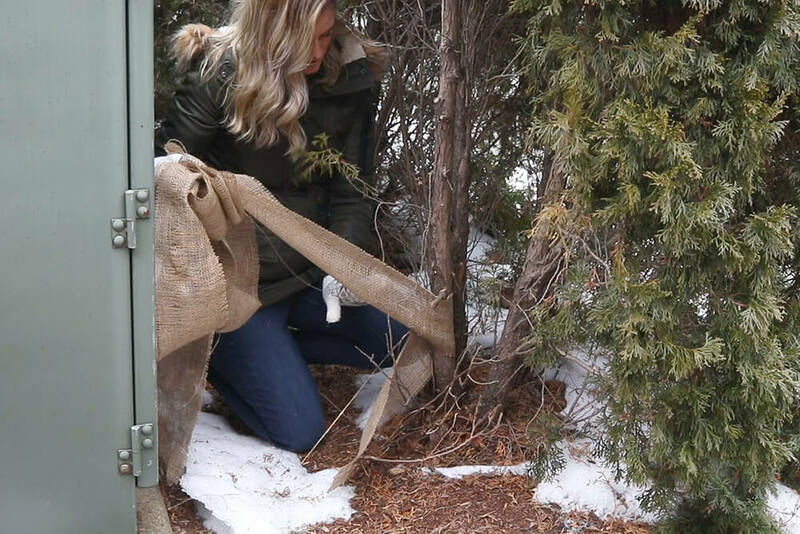 This will help the trees keep their shape through the winter months and will help them stay strong under the weight of the snow. This isn’t necessary for all bushes, but it’s recommended if your tree or sapling has an exposed trunk. 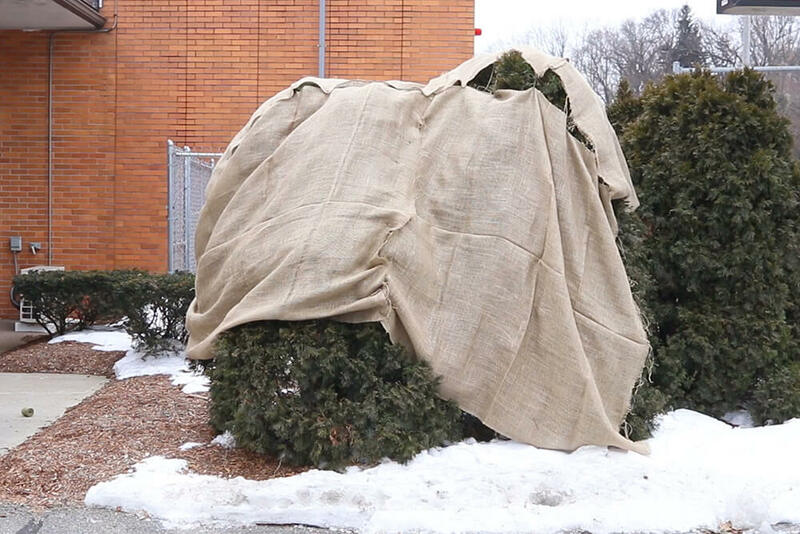 Starting at the base of the tree, use burlap tree wrap to protect its trunk. Wrap until you reach the bottom branches of the tree. Tie this off loosely. 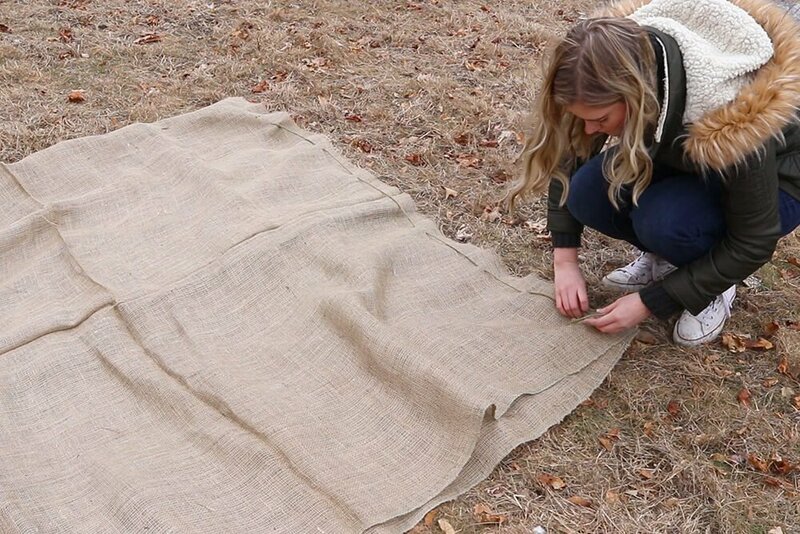 Slide the burlap over your trees. Sew down the remaining edge and along the bottom edge. When it comes time to take your wrap off, simply cut away the material. 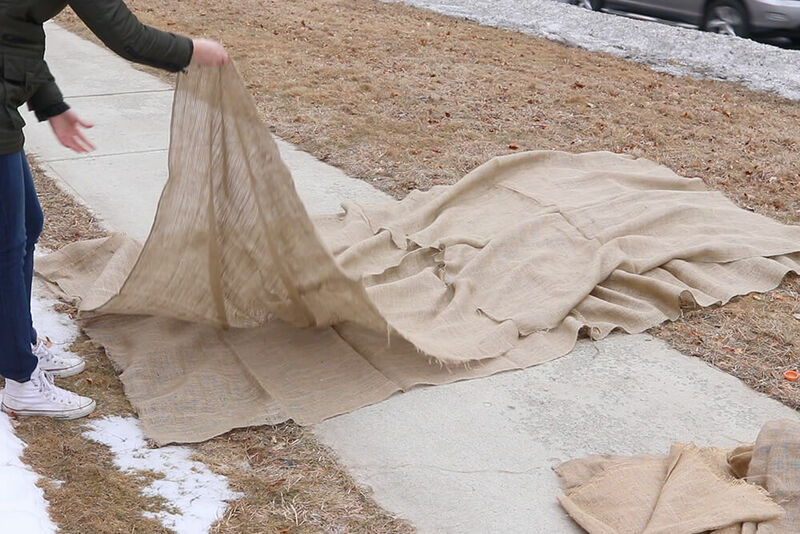 Burlap is biodegradable so it can be thrown away easily, used for other projects, or even used for the next year’s tree wrap. Ready to get started? 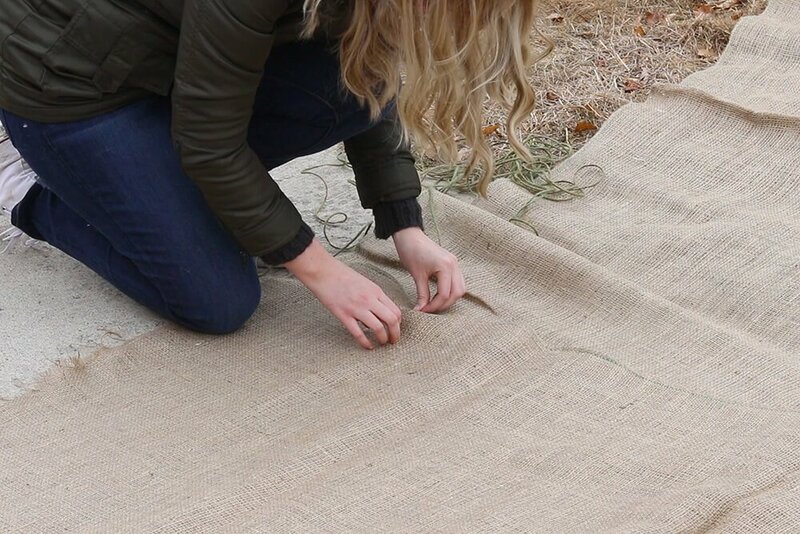 Shop burlap squares here.